CAPE ELIZABETH, Maine (February 2, 2018) – Runners looking to join the field for the 21st running of the TD Beach to Beacon 10K Road Race on Aug. 4 will need to be in the zone and at the ready March 15-16 for online registration, race organizers announced Friday. New this year, organizers of the classic American summer road race have tweaked the registration process with the goal of improving the participant experience. Partnering with Race Roster, a company offering best-in-class registration services, the TD Beach to Beacon is implementing a queue entry system. This new format requires registrants to still be quick at the 7 a.m. launch to get entered into the queuing portal, basically putting them in a virtual line, but it also provides greater time for them to complete the registration process without losing their place. The controlled queue entry process is similar to what is used for many high-demand events, such as concerts, cultural and sporting events. The new process will be in place for both days of online registration. On Thursday, March 15, Cape Elizabeth residents will have the opportunity to register for 600 slots starting at 7 a.m. ET. Thursday, March 15 at 7 a.m. ET: online registration opens for Cape Elizabeth Residents only. First come, first serve. Limit of 600. Friday, March 16 at 7 a.m. ET: online registration opens to general public. First come, first serve. Limit of 4,000. 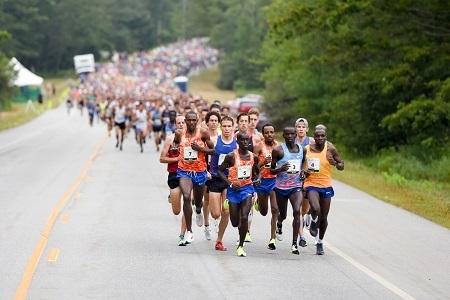 Due to high demand for limited space, the race is implementing a controlled queue entry for both the Cape Elizabeth Residents registration and the General Entry registration to ensure a smooth registration flow when registration opens. Once a registrant has entered the queue page, they will be able to enter the registration form based on their position in line. However, this process could take anywhere from 0 – 20 minutes, so patience is needed. Registrants in the queue are advised NOT to refresh, open multiple tabs or close the window, so as not to lose their spot in line. By entering the queue, a registrant is not guaranteed a spot, but doing so will hold their place in line if/when a spot becomes available. Registrants will be notified if at any time the race sells out. Registrants will only be able to register one person at a time. If a registrant wants to increase their chance of being able to run with specific people, race organizers highly recommend that each person be present with their own device for the launch. Multiple tabs open on the same device will NOT allow for a successful registration. The remaining 1,950 spots will be distributed by lottery, which will begin immediately after online registration is closed. Participants can enter as an individual or as part of a team of up to six members. Additional lottery details can be found at www.beach2beacon.org/2018-registration.html. Registration for the lottery will be held from March 16 until 11:59 p.m. on Sunday, March 25. The lottery drawing will be on March 27. The race will charge a $5 fee to enter the lottery. Winner’s names will be posted on the race website. The race allows transfers from April 1 through June 30 and there is a $5 transfer fee. Cape Elizabeth residents registered in the 600 entries allocated to Cape Elizabeth residents can only transfer to another Cape Elizabeth resident. Detailed registration information is available at www.beach2beacon.org/2018-registration.html. Following close of registration and the lottery, the remaining bibs will be distributed to world-class athletes, the new and past beneficiaries as well as sponsors. Also, included in this mix are the 110+ “Legacy” runners who have participated in each of the past TD Beach to Beacon races. All will be invited to register beginning April 1. In addition, the race’s 2018 beneficiary, to be announced soon, as well as past beneficiaries will make bib numbers available to runners in exchange for fundraising and/or support. The race’s charity bib program has helped Maine charities raise more than $1.6 million over the history of the event. Online registration for the Kids Fun Run – set for Friday, Aug. 3 at Fort Williams – will begin online April 1 and continue through July 31, however, parents can also register their children at the race Expo and at the event. 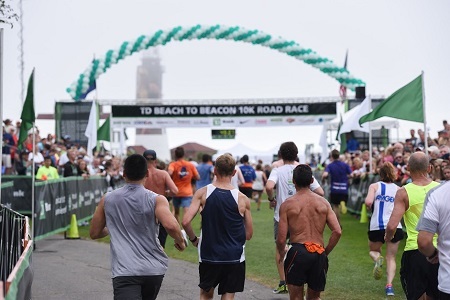 The TD Beach to Beacon draws runners from throughout the region and the world to picturesque Cape Elizabeth. 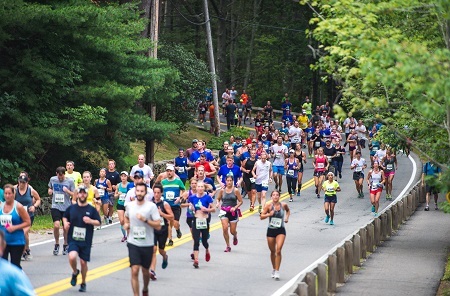 The race begins near the Crescent Beach entrance on Route 77, winds along tree-lined streets and past breathtaking ocean vistas and ends in Fort Williams Park at the historic Portland Head Light, the most photographed lighthouse in the world. 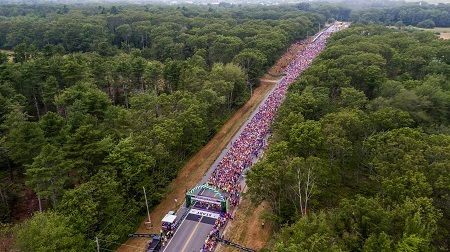 For the special 20th running of the race in 2017, a record-setting 6,887 runners from 18 countries, 43 states and more than 270 Maine cities and towns finished the winding, rolling 6.2-mile coastal course. Thousands of spectators cheered runners along the route and at the finish, and more than 800 volunteers helped ensure a smooth operation. The race debuted in 1998 with 2,408 runners crossing the finish line. More than $90,000 in prize money is awarded to the top finishers and place winners in the various categories for men and women, and a separate $30,000 donation is provided each year by the TD Charitable Foundation, the charitable giving arm of TD Bank, America’s Most Convenient Bank®, to the race beneficiary.